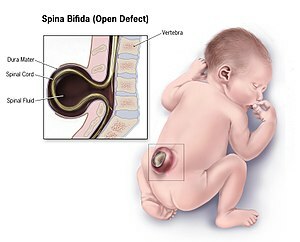 ^ 1.0 1.1 1.2 Spina Bifida: Condition Information. 2012-11-30. ^ 2.0 2.1 Are there disorders or conditions associated with spina bifida?. 2012-11-30 [8 May 2015]. ^ 3.0 3.1 3.2 3.3 3.4 3.5 What causes spina bifida?. 2012-11-30 [8 May 2015]. ^ 4.0 4.1 4.2 4.3 How many people are affected by or at risk for spina bifida?. 2012-11-30 [8 May 2015]. ^ 5.0 5.1 5.2 How do health care providers diagnose spina bifida?. 2012-11-30 [8 May 2015]. ^ 6.0 6.1 What are the treatments for spina bifida & related conditions?. 2012-11-30 [8 May 2015]. ^ 7.0 7.1 Kondo, A; Kamihira, O; Ozawa, H. Neural tube defects: prevalence, etiology and prevention.. International Journal of Urology. January 2009, 16 (1): 49–57. PMID 19120526. doi:10.1111/j.1442-2042.2008.02163.x. ^ 8.0 8.1 Sandler, AD. Children with spina bifida: key clinical issues.. Pediatric Clinics of North America. August 2010, 57 (4): 879–92. PMID 20883878. doi:10.1016/j.pcl.2010.07.009. ^ Neural Tube Defects (NTDs): Overview. 2012-11-30 [8 May 2015]. ^ Deming, Laura. Pediatric life care planning and case management 2nd. Boca Raton, FL: CRC Press. 2011: 392. ISBN 9781439803585. ^ Castillo-Lancellotti, C; Tur, JA; Uauy, R. Impact of folic acid fortification of flour on neural tube defects: a systematic review.. Public Health Nutrition. May 2013, 16 (5): 901–11. PMID 22850218. doi:10.1017/s1368980012003576. ^ M. Memet Ö̈zek. Spina bifida : management and outcome. Milan: Springer. 2008: 58. ISBN 9788847006508. ^ Canfield, MA; Honein, MA; Yuskiv, N; Xing, J; Mai, CT; Collins, JS; Devine, O; Petrini, J; Ramadhani, TA; Hobbs, CA; Kirby, RS. National estimates and race/ethnic-specific variation of selected birth defects in the United States, 1999–2001.. Birth defects research. Part A, Clinical and molecular teratology. November 2006, 76 (11): 747–56. PMID 17051527. doi:10.1002/bdra.20294. ^ Bhide, P; Sagoo, GS; Moorthie, S; Burton, H; Kar, A. Systematic review of birth prevalence of neural tube defects in India.. Birth Defects Research. Part A, Clinical and Molecular Teratology. July 2013, 97 (7): 437–43. PMID 23873811. doi:10.1002/bdra.23153. ^ Puri, Prem. Newborn surgery 3. London: Hodder Arnold. 2011: 811. ISBN 9781444149494.